ILSPA’s Legal Secretaries Diploma unit relating to Wills, Administration and Procedure sets out why it is important to make a will, and the assessments for the course require Students to type a will. It is possible to make a will without professional assistance; in fact, it is possible to pick up a draft will with basic instructions on how to complete the same from a high street stationery retailer. 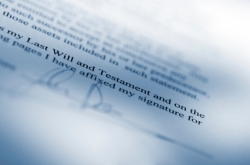 Whilst this can produce a valid will, it is also very easy to make a mistake when writing the will or signing it, which can render it invalid or ambiguous. An alternative to Solicitors is Will Writers. Unlike Solicitors, they don’t have to be qualified or regulated, but they can choose to be a member of a recognised trade body such as the Institute of Professional Will Writers or the Society of Will Writers. It is also possible to make a will with your bank, but you may incur high charges if you wish to appoint the bank as a sole or joint executor, which is often a percentage of the value of the estate (anything up to 5%), regardless of how complex the estate actually is to deal with. Finally, there are also online will-writing services which some people find quick and convenient. As mentioned, individuals may write their own will or may pay a professional to write it for them, and the LSB’s research indicates that professionals write approximately 85% of all wills. The statutory regulatory objects for wills are outlined in the Legal Services Act 2007, and the LSB have found comprehensive evidence that the market is working contrary to these. The consequences of a poorly drafted will can have far-reaching consequences which, for some families, may be disastrous. For example, in Ross v Caunters , Solicitors drew up a will on the testator’s instructions and sent it to him for execution; the testator’s wife was one of the witnesses. The Solicitors had not warned the testator beforehand that this would invalidate the bequest to the wife under s15 Wills Act 1837 and did not notice anything when the will was returned to them for safekeeping. Following the testator’s death, the Solicitors told the wife the gift to her was invalid, and she sued successfully for negligence. Following a two-year investigation, the LSB have made various recommendations to the Lord Chancellor in respect of the regulation of will-writing activities, estate administration and probate activities so that the significant risks consumers currently face when using these critical services can be reduced. The conclusions of the report state that whilst estate administration and probate activities are not yet added to the list of reserved legal activities, will-writing activities should be added. If this is accepted it will give consumers better protection and consistent access to redress by allowing access to the Legal Ombudsman for consumers of all will-writing providers. It will require regulators to develop proportionate and targeted approaches to supervising providers by identifying and targeting risks and taking swift enforcement action if things go wrong. There are questions as to whether this recommendation is sufficient, whether omitting estate administration and probate activities from the list of reserved legal activities will allow fraudulent behaviour to continue, and why the administration of estates does not appear to have a need for competence and rectitude. Estate administration is the most profitable area for lawyers, and it could be argued that this is where the need for protecting clients is the greatest. If will writing is taken away from unregulated providers, they are likely to shift their focus to estate administration with fewer safeguards being afforded to clients.